Corsair Crystal Series 570X RGB ATX Mid-Tower Case | Nerd Much? 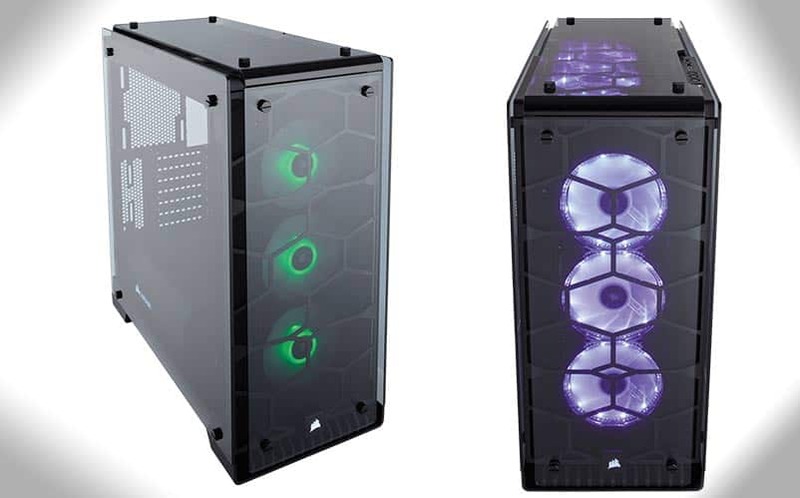 Not many people get excited about computer cases nowadays — most of the newer cases have plenty of bells and whistles that are now standard (like LED lights). But we’re not most people, so when we came across these brand new Corsair Series 570X RGB ATX Mid-Tower Cases this afternoon, we were stoked. These cases have a unique design that uses tempered glass panels on four sides, allowing PC builders to display all of their components for all to see — an undeniably cool, clean look that most would be proud to have at their desks. The case comes with three case fans (with room to support six), and it has removable fan trays in the front and on the top for additional space. The fans also have RGB LED capabilities, with a controller on the top of the case that allows users to change the fan’s color, mode, and speed with the push of a button. But there’s also a lot of thought put into the design as far as airflow is concerned (which is super important to those building powerful rigs that generate a lot of heat). The Crystal Series has the drive cages hidden and out of the way of the airflow path, which allows that sweet, sweet cool air to hit your components. It has two 3.5″ hard drive bays, two 2.5″ SSD drive bays, and seven expansion slots. It’s compatible with ATX, microATX, and mini iTX motherboards. So if you’re in the market for a ridiculously cool-looking PC case for your next build, the Corsair Crystal Series 570X RGB ATX Mid-Tower case is available on the official Corsair website for $179.99. For more ridiculously cool nerdy stuff, stay tuned to Nerd Much? for daily finds. Syfy’s Incorporated Spoiler-Free Review: Is it Worth Watching?